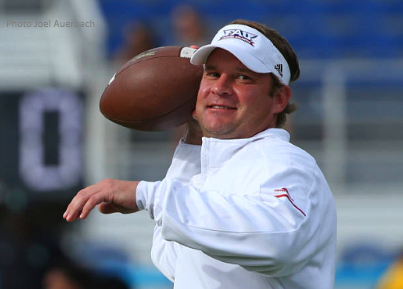 With Florida Atlantic is looking to close the regular season with a win against the 49ers on Saturday at Schnellenberger Field, Coach Lane Kiffin met with the media on Sunday. Below are the highlights of his session. Not sure if you have heard about (Brad) Lambert's firing over at Charlotte. Real quick do you have three cents on that? Maybe how that makes things a bit more difficult to game plan? I did hear that. I don't know that it changes much of the game plan because I don't believe he was calling the plays. Unless the head coach is calling the plays, which I don't think he did on one side of the ball. I assume that both coordinators are still there, so I don't think it will change much. Three of the conference losses have been by one score. If you think about it they have all been lost in the second half. How frustrating is it to think that you flip one or two of those games you may be 7-4 instead of 5-6? It is frustrating. There is a good and bad to everything, like you have heard me say before. The good thing is that we are right there in the games and we are ahead in all these games. It shows that we are really good when we play well. The bad thing is, it was one play in all those games that makes the difference. Those are very tough to deal with. You have said if it is bowl eligibility that motivates the players, now that you are in this spot with one game left, it means you have one game left if you get it to be eligible, if not you are not. Does that change things a little bit going into the final week? No. You still prepare the same way. Like I have said before, if that is motivation for them (the players) then great. But obviously, we want to go to a bowl. It is more practices for your team, developing young players, (and) excitement for the fans. When we got here, if you had said, hey we are going to go to two bowls in the first two years after not going to a bowl in nine years that's good. Have the end-of-season captains been named yet or is that going to come later this week? That is after the season. With regards to being bowl-eligible a couple of years in a row if that happens, it is kinda interesting you went 3-9, 11-3 and potentially 6-6, with one to play. Your step here has been has kinda been in reverse, if you went 6-6 first, and then 11-3, people would have been ecstatic about that. How do you talk to fans about the perspective of being in two bowls as pretty good? I think you look at the whole body of work. Just like you do with any staff, whether it is one year or 10 years. What have they done over the course of time? Ours was a little bit backwards. You look at a team that had been struggling like UCF and what Scott (Frost) did there. I think they went 6-7 and then they had the great year. We had the great year and hopefully now going 6-6 and potentially 7-6 with a bowl win. Could you assess (Chris) Robison's play last Thursday night? It seemed like the first time on the road he showed some signs of a nice game down the field. I thought the game was kinda indicative of the season. Some really good plays. The second interception was not his fault. That is a catchable ball. We are at midfield going down to either tie or win the game. And the first one was a really, really, really bad throw and decision by him. So, kinda indicative of his season, some really good stuff but then a disaster play. It feels like it has been a really quiet year for Willie (Wright). Do you think that part of that is teams prepared to stop those jet sweeps? The play actions off of those and other things work off those because of how much we ran that a year ago. I think he hasn't really been the same since when he got knocked out in that game. He has not played like normal Willie. Some very strange mistakes, even in the game (North Texas) we've got a big play where Chris (Robison) throws it behind him, so it looks like Chris' fault, well Willie took too many steps and that's why the ball was a little bit off versus potentially a touchdown. That hit rattled him. He just hasn't come back the same. I don't know whether you have had a chance to look at the bowl scape, nationally, and where you guys fit in there. Are you at all concerned about getting to be bowl eligible and still remaining home for the bowl season? Not being chosen? No. I have not heard of that. I've heard that if we win, we are going to a bowl game. I don't know anything about not going at 6-6.
Who have you heard that from or is that just the common thought if you get bowl eligible you go? I'm not really going to get into who I heard it from, but it was discussed a week ago even which bowls we would potentially go to with six or seven wins. We will see. So, internally you guys have addressed the possibility of what happens if you guys get to 6-6 and the realism that somebody at 6-6 could be left out it sounds like, it just won't be you. Like I said, I have not heard anything about not going to a bowl game with six wins. Obviously, early in the season the running game was struggling to get it going. Motor (Devin Singletary) obviously already has over 1,000 yards. Is it kinda neat to you that Kerrith (Whyte) could also finish with over 1,000 yards? Those things are good for your program. Something that you can recruit to for years. One, you have a player or two players that gets certain things that helps your program. Whether it is winning awards like guys do or whether it is certain stats. People say ok I want to go there, they have proven they can have two backs rush for 1,000. I know you don't like talking about the refs that much, but there was some strange calls on Thursday, especially that phantom timeout. How frustrating was it when little things go wrong that are out of your control and you really can't get your team to rally behind that? Is that difficult to do? Are you frustrated with the refs? Yeah, like I said when you are in a one-play game like that, a game of inches, whether it is the ball going in on a field goal or a call here or there…or having an extra timeout at the end, those things can all be very frustrating. When choosing a punt returner, how do you balance the decision to go with a big play guy like maybe Willie (Wright) or Desean Holmes versus a sure-handed guy like say Dante (Cousart) was when he was in there? We are just trying to get the ball back. We don't really even expect a return, I'm just trying to get the ball back, especially when our offense is playing well. A possession of the ball is so valuable versus a five- or 10-yard return. Have you noticed a difference with Dante out of there now? Yeah, it is a little bit why he was back there because you could count on him catching the ball. It is very nerve-racking watching these guys.